With temperatures returning to seasonal highs this week, it seems this past weekend may have been summer’s last hurrah. Time to reflect on an amazing three months that included hiking, kayaking, canoeing, trampoline bouncing, sandcastle building, Saskatoon berry picking and lots of swimming. Getting muddy feet at the lake = fun! What my summer didn’t include? Crafts of any sort (kill me now), mall visits or time in the basement watching movies when it was beautiful outside. After spending 10 days in Fernie, B.C. (during which time I missed Calgary not at all), I came to realize I am a nature-mama. I want my kids outside exploring the great outdoors and catching butterflies, discovering beaver trails and finding pretty-coloured rocks. 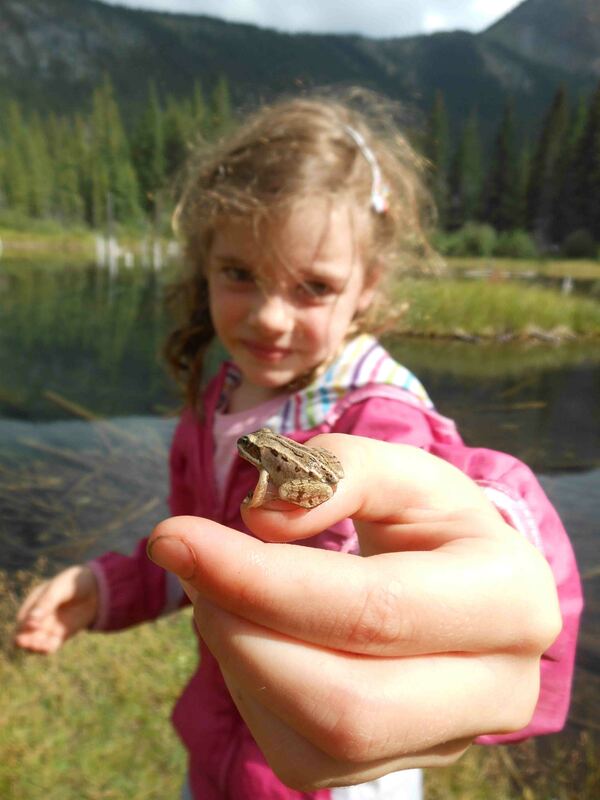 My kids are drawn to water and Avery has no problem tracking down (and capturing) lake denizens. It’s awesome! Note: dirty fingernails means she’s having fun. A recent Motherlode blog in the New York Times talked about how spending time outdoors climbing trees not only teaches kids their own physical boundaries, it builds their confidence. It reminded me of all the hoopla several years ago surrounding “nature deficit disorder.” Remember that? The media was full of stories about how this generation of children is spending too much time inside playing video games instead of playing street hockey or jumping in puddles after a rainstorm. They hypothesized the phenomenon was creating a bunch of fat, socially mal-adjusted kids who couldn’t tell the difference between a robin and a rooster. The upshot? 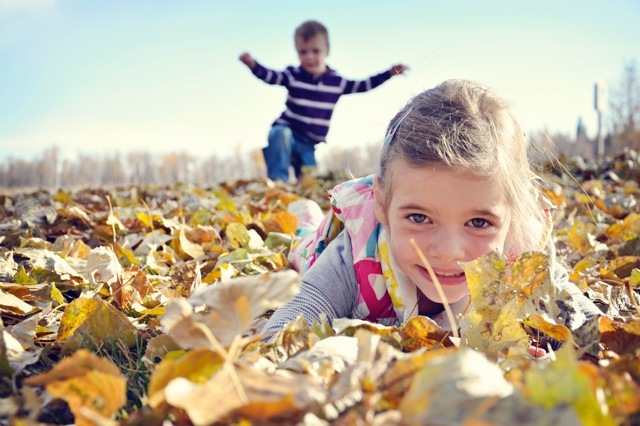 Nature is a great, free source of active fun that helps kids grow. Playing “Leaf Monster” = fun! Taken together, these two ideas — encouraging my kids to get a daily dose of nature while at the same time letting them (or, ahem, gently pushing them) to take risks and step outside of their comfort zone — have somewhat shaped my parenting philosophy. But still, I have to remind myself to stop saying, “Be careful!” every time Avery goes out on a limb. And I have to willfully ignore Bennett’s repeated requests for “Help!” when he’s navigating a hiking trail — nine times out of 10 he can manage on his own and is super proud of himself afterwards: “I did it all by myself, Mommy!” I also turn a blind eye to the dirty feet, grass-stained clothes and mud-wedged fingernails (difficult, but not impossible), and try to remind myself that dirt is good for my kids, even if it’s bad for my floors. Really. I’m sad the days are getting shorter and the temperatures cooler, making it less inviting to go outside and play. But I welcome winter and a new season of challenges and adventures: ice skating on a frozen pond, skiing down a snow-covered mountain and lots of sledding. Bring it on! 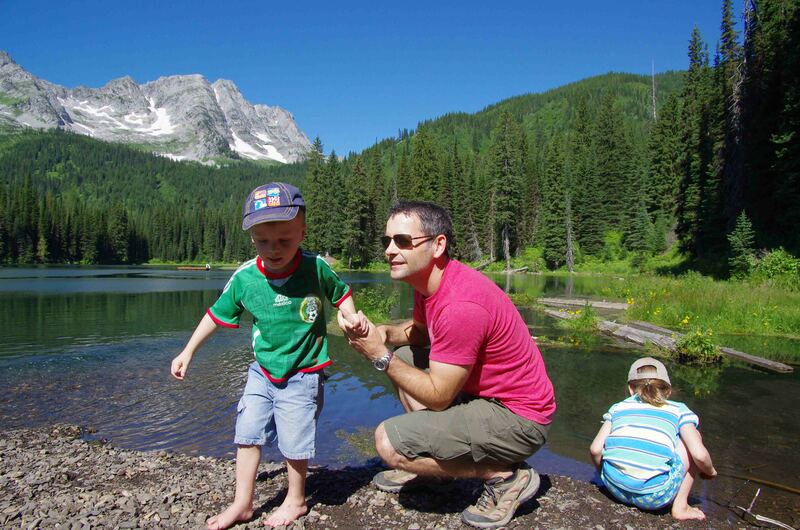 This entry was posted in Outdoor Adventure, Parenting and tagged hiking with kids, let kids play outside, nature deficit disorder, nature parenting, nature parenting philosophy, outdoor activities with kids. Bookmark the permalink.